Referenced by ParticleData< P >::fillGhosts(), and ParticleData< P >::remapOutcast(). Routine for transfering particles between AMR levels. Arguments: a_partValid: the destination to which particles will be sent if they meet the requirements. 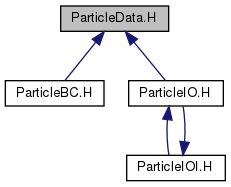 a_PD: the source from which the particles will be transfered. a_mask: this defines the valid region. If a_flip is false, a particle will be transfered from the source to the dest if it lies in a region of the domain where the mask is true. a_dx: particle position will be converted to integer indices by binning them by this cell spacing. a_refRatio: a_mask will be copied onto a boxlayout that has been refined or coarsened by this argument (refined if positive, coarsened if negative.) This is to allow comparison with mask arrays defined on arbitrary refinement levels a_flip if true, the sign of mask will be treated as reversed (i.e., this becomes a collectInvalidParticles function). References CH_TIMERS, coarsen(), D_DECL6, ParticleData< P >::getBoxes(), refine(), and List< T >::transfer(). References CH_TIMERS, coarsen(), D_DECL6, ParticleData< P >::getBoxes(), and refine().